World Book Day is the biggest celebration of its kind. The aim of it is to celebrate authors, books, illustrators and – of course – reading! It’s a big international event, started 22 years ago, celebrating books and reading. It’s organised by a charity and takes place in more than 100 countries all over the world, although some other countries actually celebrate it in April. Its aim is to give every child a book of their own and to help young people to do that, book tokens are given out at schools, including some nurseries and secondary schools. 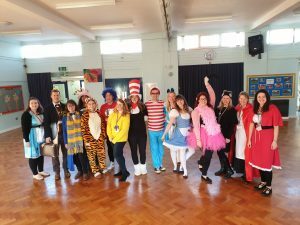 At the Potton Federation, its not just the children who like to dress up and celebrate World Book Day – staff love it too! This entry was posted in Federation News, Lower School News, Middle School News and tagged book, day, world on 7 Mar 2019 by school.